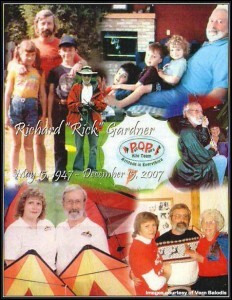 The skies above are blessed with the passing of my best friend, Rick (Richard) Gardner. Rick passed away in the early morning air on December 15th 2007 at the early age of 60. He was often known as the other half of ‘Rob-N-Air’, a well known Pairs and Stacks Team with team mate, business associate, wife, love and life partner Robyne. They had been married for many years and began seriously flying in 1988. They also really enjoyed Team Flying as they both were on many teams over the years, ‘St. 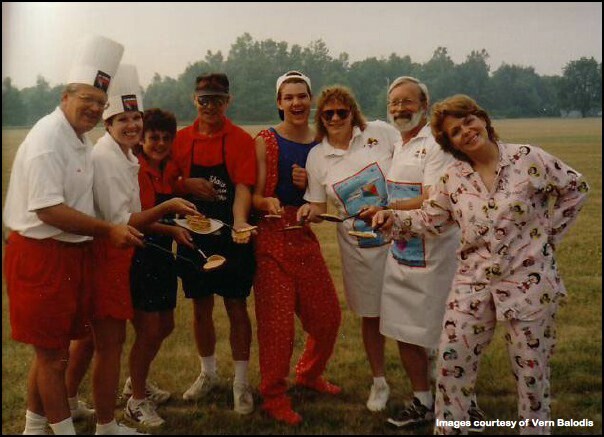 Elmo’s Fire Drill’ (Bob and Karen Roehl, John and Elaine Cosby and Rick and Robyne Gardner), ‘P.O.P.S.’ (Al Hargus, Vicki Romanoff, Robyne and Rick), ‘Windstars’ (Vern Balodis, Robyne and Rick) and of course the first competitive Quad Team, ‘V.V.R.R.’ (Vern, Vicki, Robyne, Rick and with swing in alternate Mike Delfar). 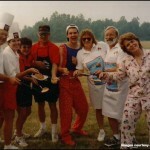 ‘Rob-N-Air’ also participated with the ‘Captain Eddies Flying Circus’ (with now departed Mike Gillard, Al Hargus, Butch Cantfield and Scott Nuss and still present, the Lord have Mercy, Vern Balodis, Vicki Romanoff, John Barresi, Terry Thurston and Ed Hayman) at the Lisle, Illinois professional ‘Eyes to the Skies’ Balloon Festival. Rick competed in as many events as he possibly could register for, until we all (Al Hargus, Lee Sedgwick, Sue Taft-Sedgwick, Sue Balodis, Robyne, Rick and myself) could sign up for the very first Judge’s Training Seminar, offered at the East Coast Championships in 1989 by Olan Turner, Mike Carroll and Red Braswell. We all felt we were judging novices, but took on the challenge of judging anything we weren’t competing in. Rick and Al felt judging was so important, they began a new precedent. They always requested to Head Judge the Individual Precision Novices and have a pre-fly meeting, followed by a post-fly meeting to explain challenges, pitfalls and extreme highlights, hopefully helping the flyers learn a little more about what was expected from the judges and where some of the targets where for improving and changing classes. Soon thereafter Rick and Robyne were often offered the distinction of Chief Judge and Event Coordinator at many significant and vital events across the country with a very influential one being the AKA Grand Nationals in Florida. Rick also received coveted Olan Turner Award. Rick was known also as the Swiss Army Kite Man. When many people where asked for help with their equipment, whether it be structural or bridal or just plain troublesome, they would often send them to Rick. He always seemed to have the right tool or the logic to come up with a solution. 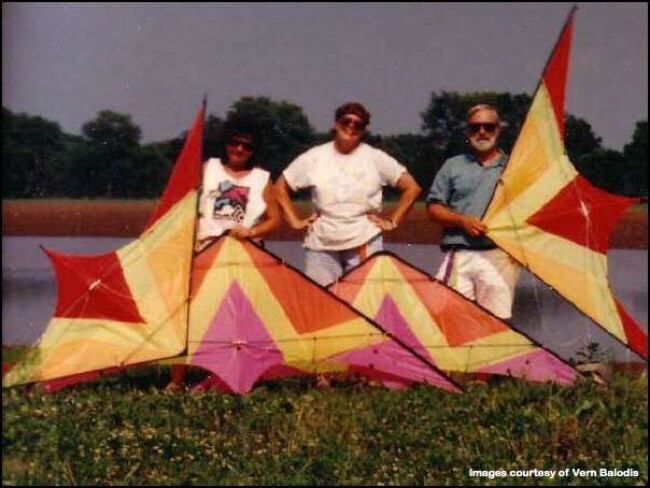 He started kiting early as a child with his grandfather showing him and his brothers, Doug, Gary and David, how to build a delta out of newspaper and sticks. Later in life, experimenting with larger deltas, they would let them pull them across farmland, on a sled in the middle of winter. Him and his brother Doug learned in history class about the famous Cody man-lifter kite and always dreamed of making one and experimenting with the pull. 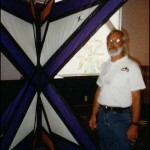 Rick and I where close to building one for profit, by offering rides to kite flyers at kite events. Early after I got to know Rick and Robyne well enough, shortly after they were inducted as honorary members of Captain Eddies Flying Circus, late in the evening after my teammates where still partying or sleeping, I would sneak away to find their room, just to talk or to continue partying with them, because they would have so much talk about, so much of interest. I really do love them. They were also loved by so many other kite flyers as many sponsored them. 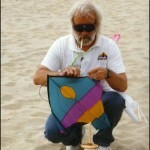 Maybe only with a kite or two, but they knew they would get the kind of reviews that could help them. 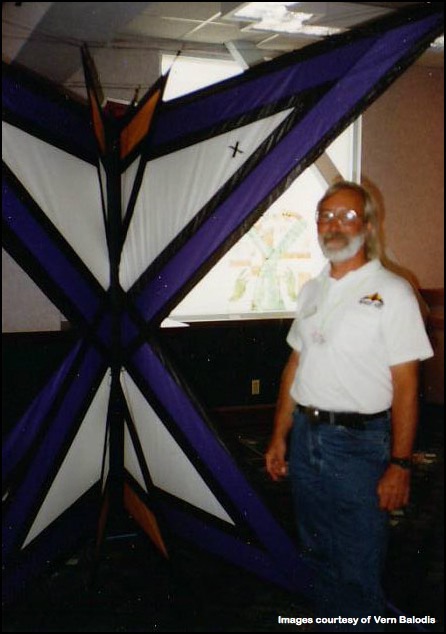 Their greatest sponsor of all was Bill Kildow of Nemisis Kites, but they also received donations from Top of the Line Kites, Revolution Kites and of course, Joel Scholz. Rick worked for Ford Motor Company for many years. 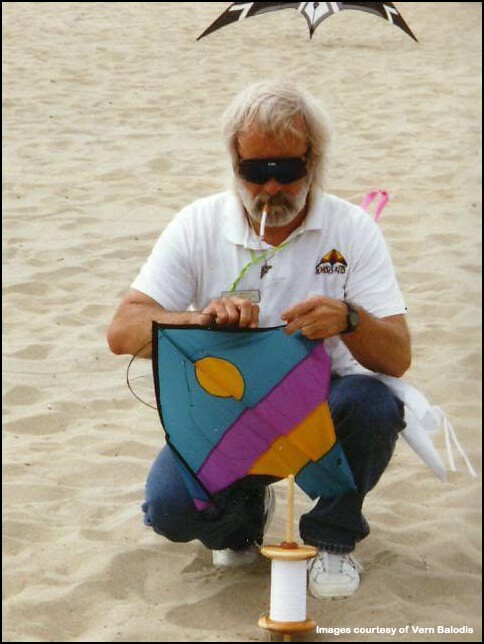 He made tools for Ford and this helped him make ingenious tools and gadgets for kiting. Rick also had many hobbies, such as, stained glass artwork, fly fishing, kayaking, RV camping, glass bead creating, origami and many more. There is so much more I could say about my good friend, but this poem written by an unknown Maryland author may say it pretty well. They all call us just big kids out here having fun, maybe this heart-warming verse does just say it all… Children are like kites. You spend a lifetime trying to get them off the ground. You run with them until you’re both breathless. They crash – you add a longer tail. Finally they are airborne, but they need more string, so you let keep letting it out. With each twist of the ball of twine there is sadness that goes with the joy, because the kite becomes more distant and somehow you know it won’t be long before the beautiful creature will snap the lifeline that bound you together and soar as it was meant to soar – free and alone. This entry was posted in 2008, Issue 58 (Jan/Feb), KL Archive and tagged people. 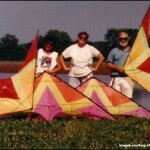 Issue 58: Featured Store: Elmer’s Flag and Banner, Kites Too!